I adore these gentle leggy spiders. The name 'daddy long-legs' is also given to the harvestmen, which are not true spiders, having a single body section. But this blog is about the spiders version - Pholcus phalangioides, Family Pholcidae. Before I introduce the blog star, I must add my favourite photograph, taken of a spider who lived under the table in the lounge room for a long time. 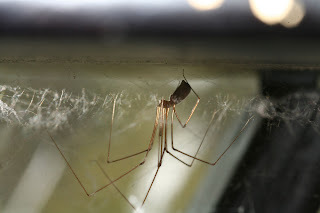 Please meet Mother-cups, the daddy long-legs who is definitely a mother - holding her egg sac in her jaws, in one of the kitchen cupboards above the coffee cups. She just sits there patiently waiting for them to hatch. I adore watching the young emerge, the greatest confusion of legs you could ever see. I have seen a female with an egg sac take prey. When a fly was caught in her web, she attached her egg sac to the web, left it there, had dinner and then returned to take her egg sac in her jaws again. It is a myth that these gorgeous creatures have the most dangerous venom - they don't. They can pierce the skin, but it is very hard to get them to bite. They are just too docile. They feed often on other spiders. I have had a few hundred breed in the kitchen and lounge area over the last year or so, but there are only a dozen in residence. I have a feeling they ate each other. I adore watching the males and females as they share a web, which they often do for weeks. They will twang the web at each other constantly communicating, and eventually the male will make his approach. At times he will make a sudden retreat, obviously she is still not ready! Their vast webs are a means of detecting the world and communicating with each other. I will blog them often - they are my constant companions in the kitchen. But the moment I am really waiting for is to see Mother-cups' young hatch. Everyone in the world can have the pleasure of watching these beautiful spiders. Just leave their webs alone and use a strong torch to get a good look at them. Their egg sacs are clearly visible, and with a strong torch, each egg is visible to the naked eye. There is no better spider to watch and enjoy.